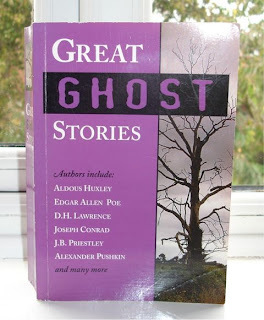 This is a collection of ghost stories by different authors including G.K. Chesterton, Walter De La Mare, O. Henry, Aldous Huxley, D.H. Lawrence, R.L.Stevenson, and H.G. Wells. So far I have read just a few of them and I’m looking forward to reading the rest. It’s a good book to dip into from time to time. Berenice is not included in Poe’s Tales of Mystery and Imagination. According to Wikipedia it was first published in the Southern Literary Messenger in March 1835 and due to public outcry an edited version was published in 1840. The opening sentence sets the scene ‘Misery is manifold.’ From then on you know that this is another of Poe’s tales of unrelieved tragedy. There is no escaping it. The narrator is Egaeus, an obsessive intellectual who falls in love with his cousin, Berenice. She is his opposite, beautiful, agile, healthy and full of energy. His obsession is monomania; he is fixated on objects to the exclusion of everything else around him. Alas, disease befell Berenice and she wasted away until all that was unchanged were her teeth. Egaeus as you would expect is devastated, but is totally obsessed with her perfect teeth and he sees them everywhere. She dies. He comes to as though ‘awakened from a confused and exciting dream’ to an horrific discovery ‘. This story is very much what I’ve come to expect from Poe and repeats a number of themes he uses in other stories – death, burial and mental illness. To me they lack suspense, maybe because they are so short. When he revised Berenice Poe wrote in a letter to the editor of the Southern Literary Messenger on April 30, 1835: “I allow that it approaches the very verge of bad taste — but I will not sin quite so egregiously again.” I not sure that he succeeded. Keeping His Promise by Algernon Blackwood is a story with a supernatural twist; he builds up a tale of gradually increasing tension. Marriott is a student at Edinburgh University studying for his exams. He is disturbed in his room by the arrival of Field, who appeared to be starving, thin as a skeleton, exhausted and under the influence of drugs. Marriott gave him a whisky and they had supper together before Field dropped with exhaustion on Marriott’s bed where he slept the night. Marriott could hear his heavy deep breathing in the next room as he resumed his studies. When morning came there was no sign of Field and Marriott feels a sensation of fear, his left arm throbs violently and he trembles from head to foot. There is the impress of a body on the bed and Marriott can still hear the breathing. In contrast Honolulu is an amusing but sinister tale of a little fat sea captain, who tells of the strange events that had overtaken him whilst sailing in the South Seas between Honolulu and various small islands. An enjoyable tale of love, betrayal and voodoo. The Hostelry by Guy de Maupassant is set in the High Alps in the depth of winter. The Schwarenbach Inn is left in the care of two mountain men as the family descend to the village below. De Maupassant’s description of the freezing conditions as the snow falls and the two men are isolated on the mountain sets the scene for the events that follow. When one of the men goes out hunting and doesn’t return the other is alone in the inn. He can’t get out because something is trying to get in! The Murder of the Mandarin by Arnold Bennett tells the story of a young wife with an unimaginative and controlling husband, set in one of the Pottery towns in Staffordshire. She wants a belt to enhance her ball dress, which leads her to a strange experience connected (or is it?) to the death of a mandarin in China. This is not a scary story. It’s a study of how an ordinary situation can become seemingly extraordinary through the power of imagination. This sounds like a really good book. So many interesting authors! I have “Great Vampire Stories” by the same publishers, and it was only disappointing in the sense that not all the stories are actual vampire stories. But putting that aside, it’s a great collection. They sure know how to pick good stories by classic authors. I need to look for this one as well. I suppose because it’s so close to Hallowe’en everyone is into Ghost stories at the moment and I just can’t read them. I think it must be because a friend and I spent one of our teenage summers scaring each other silly reading them under the bedclothes when we went on holiday together. Now, my mind jumps ahead to what is inevitably coming and I just have to put the book down. Nymeth, Vampire stories sound a bit too scary for me.Ann, I think reading on your own now you probably wouldn’t find them so scary. At least I didn’t find the ones in this collection too scary at all.